"I am the living bread that has come down from heaven. If anyone eat of this bread he shall live forever." The Institution of the Eucharist is the greatest gift Jesus left you - a gift that will help you lead a holy and peace filled life. It is the final of the Luminous Mysteries of the Rosary. and a very fitting conclusion to this new set of Rosary mysteries. You may find that it is helpful to look at a picture of the apostles and Jesus Last Supper. Or even listen to some music that will help you recall this blessed scene. 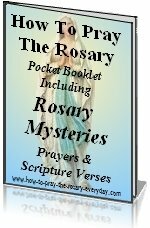 The following story will help your meditations on the Rosary as you keep it in mind as you pray the Rosary prayers. The fruit of this mystery is adoration. The chief priests were very pleased because they wanted to have Jesus put to death but they couldn't find a quiet way to arrest Him. They promised to pay Judas thirty pieces of silver and the betrayal was arranged. The time for the Passover was drawing near. Jesus gave directions to the disciples to go into Jerusalem where they would meet a man carrying a pitcher of water. They were to follow the man and tell him that Jesus wanted a place to eat the Passover meal with His twelve apostles. Following Jesus' directions, they entered the city and found the man who in turn led them to a room that was prepared for their meal. During the meal Jesus said, "Amen I say to you, that one of you is about to betray me." This really disturbed them all and they began asking "Is it I, Lord?" "He that dippeth his hand with me in the dish, he shall betray me...woe to that man by whom the Son of man shall be betrayed: it were better for him, if that man had not been born." Then Judas who had already committed to betraying Jesus asked, "Is it I, Rabbi?" Jesus just responded, "Thou hast said it." Then Jesus took bread then blessing it, He broke it and gave it to His disciples and said, "Take ye, and eat. This is my body." "Drink ye all of this. For this is my blood of the new testament, which shall be shed for many unto remission of sins." After the meal they all went out to the Mount of Olives where Jesus entered His agony. Here are some additional thoughts to enhance your meditation on the Institution of the Eucharist. Another great aid for meditations would be a wonderful little magazine called the Magnificat which not only contains the daily readings and mass but also has meditations. Return often to this page when you are praying this Luminous Mystery of the rosay - Institution of the Eucharist. At the Institution of the Eucharist Jesus intended that this sacrifice, the unbloody sacrifice of Calvary would be continued in the Church for all time. By the word sacrifice I mean, an offering of a victim by a priest to God alone. The destruction of this victim in some way acknowledges that God is the creator of all things. Jesus is the perfect victim. For this reason, animal sacrifices are no longer needed in the New Law. The Mass is this renewal and it is the same sacrifice as the sacrifice of the cross. This is so for two reasons; there is but one victim and the same principal priest, Jesus. The Mass is the way Jesus commanded that his death be remembered and celebrated. But, the way the sacrifice is offered is different because on the cross Jesus suffered and died physically while in the Mass Jesus experiences no physical death or suffering. Jesus is the principal priest in every Mass. He offers His body and blood which were sacrificed on the cross to God the Father through the words and actions of the priest. Holy Orders is the sacrament by which a man becomes a priest or bishop. The first priests and bishops were the apostles and Jesus gave them the power to change bread and wine into His body and blood at the Last Supper. That is why this mystery is called the Institution of the Eucharist. The Holy Eucharist is both a sacrament and an unbloody sacrifice. Jesus is truly present body, blood, soul and divinity under the appearances of bread and wine. Appearance means the color, taste, weight, and shape of the bread and wine remain the same even though the contents have changed into the body and blood of Jesus. At Mass Jesus is offered and received. Receiving Jesus in the Holy Eucharist will create an union between you and Jesus, Who is the Source of all holiness and the Giver of graces. The Eucharist is the greatest aid to a holy life and peace filled life. Below you will find some quotes from the visions of Venerable Anne Catherine Emmerich. These are just private revelations so take what you can from them. I found them fascinating and worth sharing, considering that they were recorded 200 years before Pope John Paul II gave the Church the Luminous Mysteries, sometimes referred to as the Mysteries of Light. 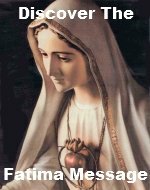 You can find the book these excerpts are taken from in our Catholic Rosary Shop. The book is titled The Dolorous Passion. "I saw him [Jesus] becoming transparent, until he resembled a luminous shadow." "I seemed to see the Blessed Virgin receiving the Holy Sacrament in a spiritual manner." "His [Jesus] words came forth from his lips like fire and light." "A brilliant light came from him, his words were luminous, the bread entered the mouths of the Apostles as a brilliant substance, and light seemed to penetrate and surround them all, Judas alone remaining dark." "He [Jesus] appeared wholly transfigured, as it were transparent, and as though entirely passing into what he was going to give his apostles." the entire substance of the wine was changed into His blood. At the Last Supper [Institution of the Eucharist] after the substance of the bread and wine had changed into Jesus body and blood, there remained only the appearances of bread and wine. This was the first Mass. During the Institution of the Eucharist, Jesus changed bread and wine into His body and blood by His almighty power. In the Mass, Jesus, through the priest, offers Himself to God in an unbloody manner. This is the sacrifice of the New Law. Missing Mass on Sundays or Holy Days and receiving Communion unworthily are serious sins. When received worthily, Holy Communion will make you closer to Jesus and increase your love of neighbor. It increases sanctifying grace and helps you avoid sin by lessening temptation to do so and helps you practice the virtues. Receiving Jesus in Holy Communion often, even daily is the surest way to bring tranquility and peace to your life. Dear Lord Jesus, Thou art both true God and true Man. And yet, Thou humbled Thyself to become a Man to suffer and die for my sins. Before Thou didst suffer Thou gave thy body and blood, soul and divinity to us in the Institution of the Eucharist. I thank Thee for this most precious gift that allows me to partake in Thy divinity. I am sorry for my many sins. I am especially sorry for the times I didn't give Thee the reverence Thou deserves in this most holy of sacraments, the sacrament of the altar. Forgive me for the times I was late or inattentive at Mass. Or didn't come visit Thee in the Church where Thou lay hidden for love of me. Never let indifference enter into my heart and teach me how to love and adore Thee as the angels do.